I had a fun time in NYC. 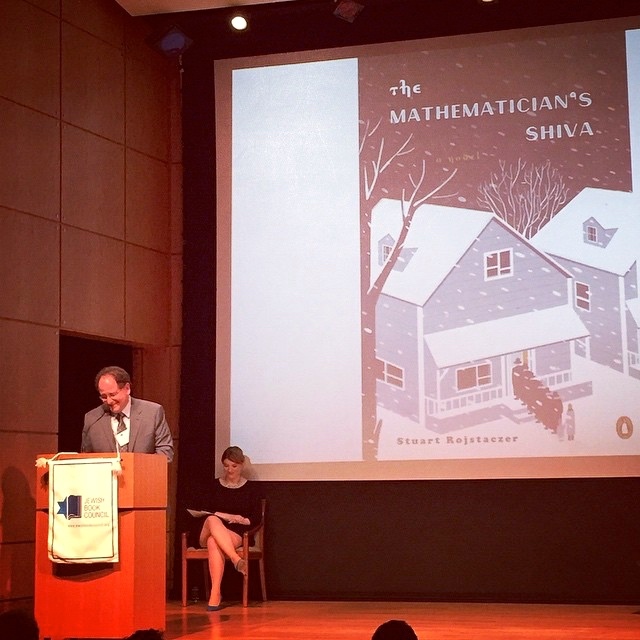 I picked up the National Jewish Book Award for The Mathematician’s Shiva and spent some time being a tourist (two shows and two museums). The Mathematician’s Shiva won another prize this month, the Friends of American Writers Literature Award, which I will pick up in Chicago in May. I’ll pick up the American Library Association’s Sophie Brody Medal finalist prize for The Mathematician’s Shiva in June at the ALA annual convention in SF. If you’re a librarian who is attending and want to speak with me, send me an email. The response to this book has exceeded my expectations by far and I am grateful. TMS has gone through four printings and its fifth will have updated blurbs and award mentions. I’ve been working with the Library of Congress, which is putting out an audio version of TMS for the sight impaired. It’s been fun riding the (unexpected) wave. I’m hibernating in April so I can make some solid progress on my next novel. I’ll do a little traveling and speaking in May.